I am yet to read a cookbook written by Yotam Ottolenghi, but I follow his column on the Guardian quite avidly. Last week, I came across his recipe for Alphonso Mango and curried chickpea salad and I HAD TO make it. 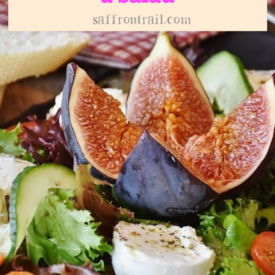 Not only because it is the mango season in India (that makes the unbearable summers kinda worthwhile) but also because I love salads with fruit in them. 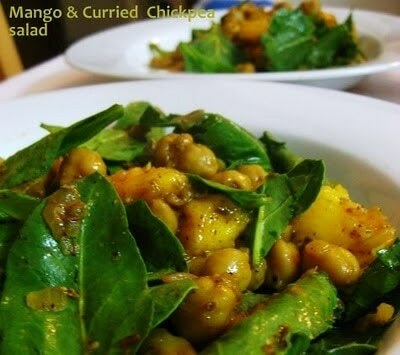 It is not one of those boring salads that make you go – “Oh nooo, it’s a salad dinner” – but something you cant wait to dig your fork into – a bit of spinach, a few chickpeas and a juicy cube of mango for the perfect bite! What a delightful combination of flavours and textures they made, isn’t that what a good meal is all about? One point of emphasis for those who’d like to try this recipe out – please grind the spice mix fresh. 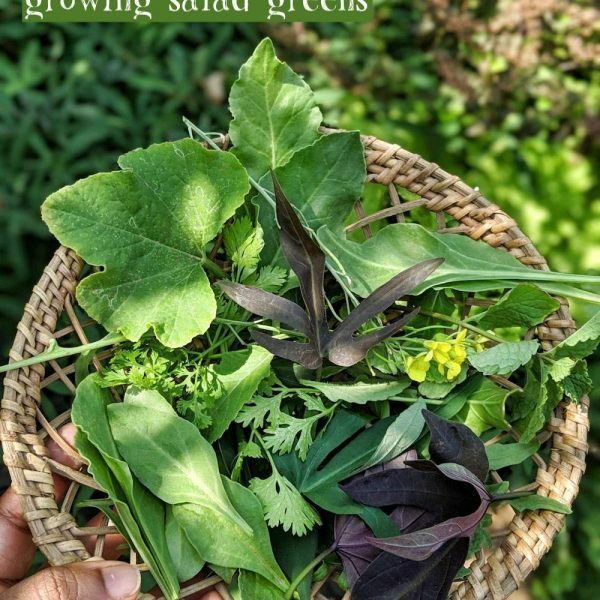 I saw the ingredients – mustard seeds, cumin and coriander seeds – dry roast and grind. The lazy efficient cook in me said, “Wait, don’t we have all those powders, why not just mix them up”. The conscience spoke up. And I dutifully measured out the spices on to a hot kadai, roasted them for a bit and crushed them in the mortar pestle – the aromas that came up to my sensitive nose said – “well done girl! This was worth it”. And then again, when we finally ate the salad, the fresh ground spices made ALL the difference! Here’s my adaptation of Chef Ottolenghi’s recipe. 1 tbsp olive oil . 1 green chilli medium hot , chopped . 1 onion large , finely minced . 1 tsp mustard seeds . 1 tsp coriander seeds . 1/2 tsp cumin seeds . 1/2 tsp fennel seeds (my addition). tsp curry powder (I used Kitchen King masala). xbd tsp turmeric ground . 1 large 2 mango ripe or medium ( I used 1 big Banganapally ). 50 g spinach baby leaves . 20 g coriander chopped fresh . Drain and wash the soaked chick peas. Place in a medium sized pressure cooker. Cover with 2 -3 cups water and pressure cook till done. They should NOT be cooked till very soft as would be the case in chole. After 3 whistles, keeping it on sim for 5 minutes should be good for the regular variety of chickpeas. Also, do not add baking soda / powder to the water while cooking. In a wok, dry roast the mustard seeds, cumin seeds, coriander seeds and fennel seeds, till aromatic (1-2 minutes). Remove and crush to a coarse powder with mortal pestle or coffee grinder. Remove in a small bowl and mix in the turmeric powder, curry powder, salt and sugar. In the same wok, heat the olive oil. Throw in the minced green chilli, sauteeing for a bit and then add the chopped onions. Stir on a low flame till onions are soft. Add the spice mix over the onions. Stir for a few seconds till mixed and then add the cooked chickpeas, turning around gently till well coated. Remove into a bowl. 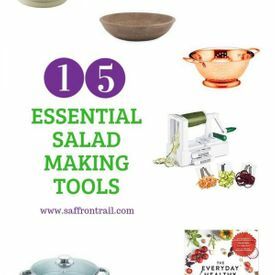 Cover and keep refrigerated until you are ready to assemble the salad. Just before assembly, skin and cube the mango into chickpea sized pieces. Wash and dry the baby spinach leaves. 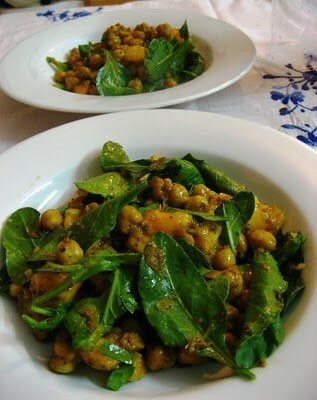 In a large bowl, toss the curried chickpeas, the mango cubes and the spinach along with the juice of a lemon and fresh coriander leaves. Serving this chilled is perfect for the hot summer evening! *The original recipe called for cauliflower too - but somehow the idea of combining cauliflower with ripe mango did not appeal to me, hence left it out. 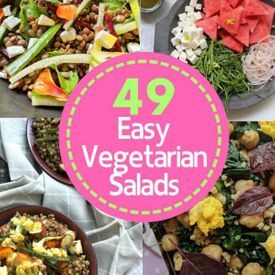 This was clearly on of the top salads we have eaten and I'm sure to be making this several times while the mango season lasts! The salad looks very colorful and I am sure the addition of mangoes to the beans must have made it very tasty. Delicious, will try…especially coz u r recommending it. Mangoes surely make our Indian summers worthwhile. :-)This salad looks very unique and different. Looks good, I might try this. Did you use palak or do you get baby spinach there? I too had seen that recipe but didn’t ever plan to make it. Mangoes and chickpeas and cauliflower…I wasn’t too sure. But yours looks gorgeous, better than his, IMHO.Guess now that someone has given it the thumbs up, I might just try it! You just HAVE to get there book Nandita …. it’s an absolute delight. I have the first one, and have the second one ‘Plenty’ on my wishlist! The Ottolenghi’s create magic in the kitchen!! Lovely Nandita..I am sure this would surely bright up a lunch! Chickpeas are good, they are good as rice too.